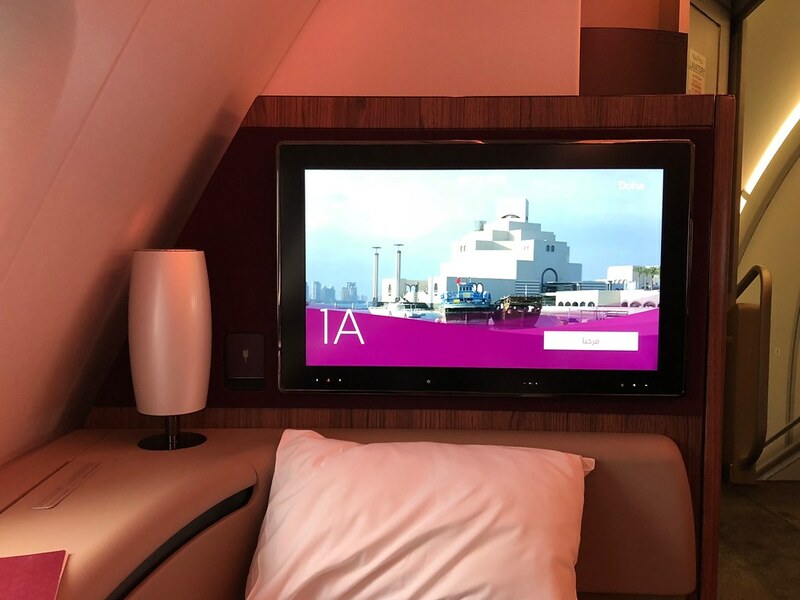 Qatar is known mostly for its great business class product which is even more so the case now that they have the new Q-suites. 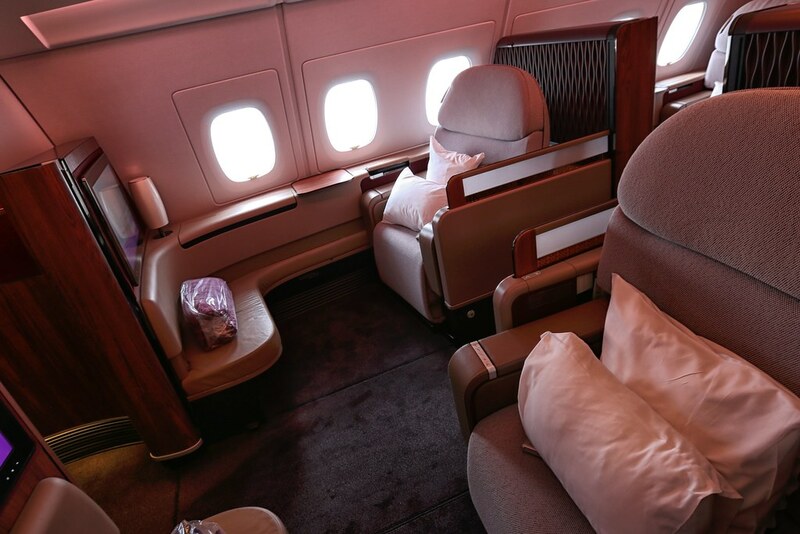 However, their first class product is still one of the best first class experiences in the sky if you ask me. 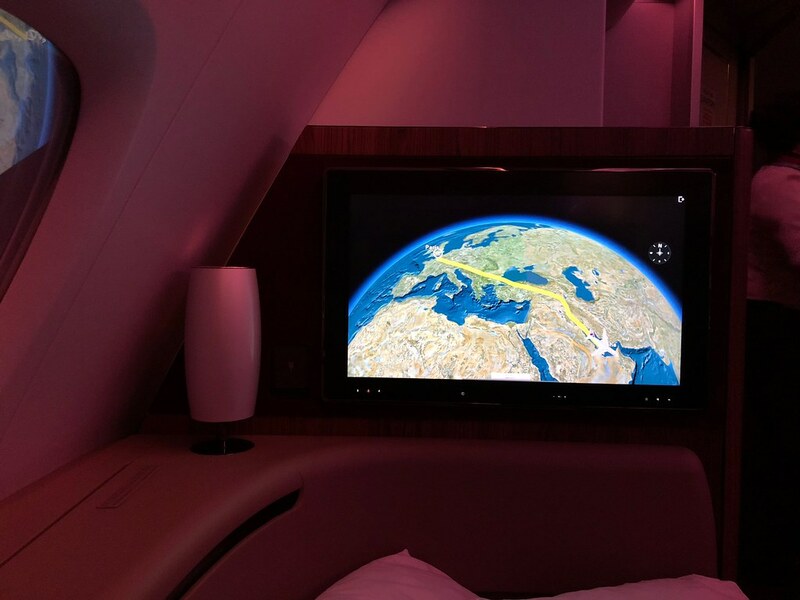 Here’s my full Qatar Airways A380 first class review from my recent flight from CDG to DOH. Qatar only has nine A380 aircraft, as they mostly fly versions of the 777 (50), 787 (30), and A350/A320 (60). Qatar Airways A380 route map. 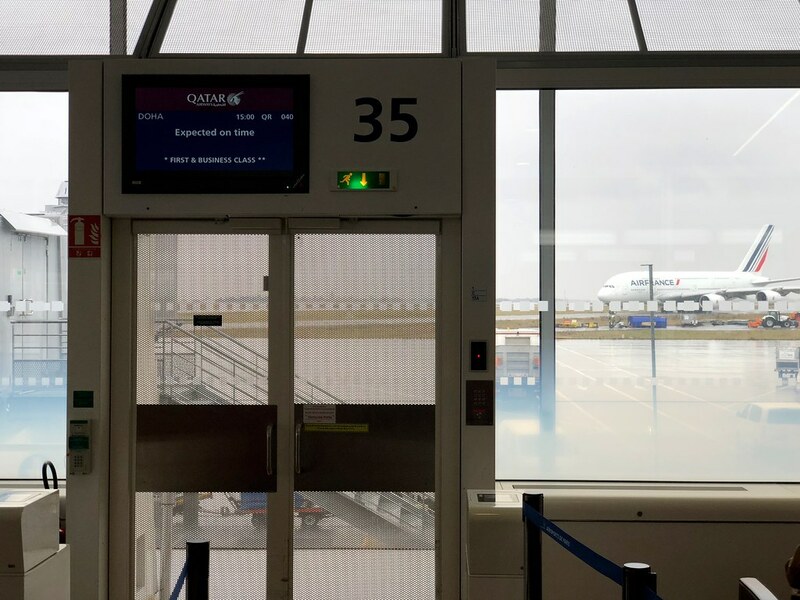 Our entire Qatar itinerary was CDG->DOH->MLE. 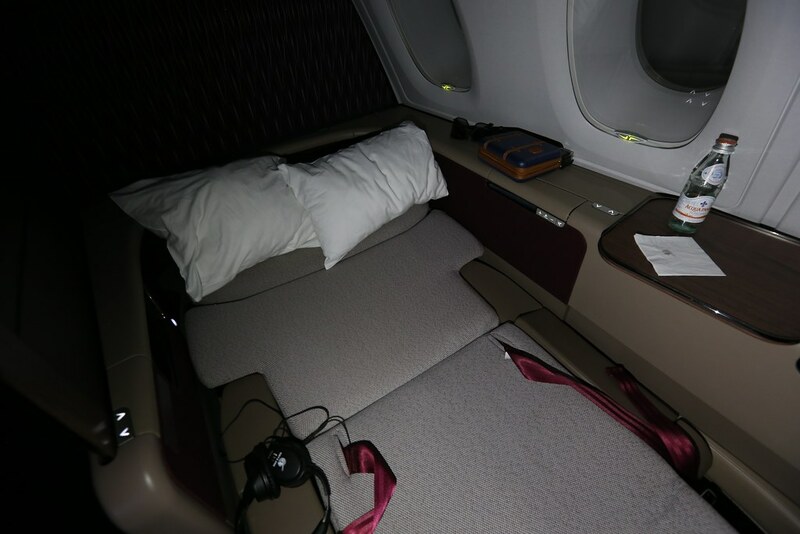 Availability from CDG to DOH was actually pretty good in first class and so it wasn’t that difficult to find award seats to Doha. However, I could only find economy award seats from DOH to MLE so I originally just settled for those. Booking these seats almost became a disaster on multiple occasions. I used 62,500 AA miles per person to book the flight and paid $153 in fees for each person. I had to call in to the Australian AA center to book but they did not process my payment in the local currency (Australian dollars). This led to my tickets being stuck in limbo and eventually cancelled. To make matters worse, I wasn’t even notified about the cancellation! Luckily, I caught that it happened a few days later. And I actually got even luckier, business class seats had opened up so I was able to change my booking from economy to business class to the Maldives without having to pay any change fees. But the drama wasn’t over there. Several Middle Eastern countries cut off diplomatic relations with Qatar in June 2017 and the Maldives joined in on that. These countries were banning flights from Qatar so I was really nervous that my booking would be cancelled. I was very close to routing through Colombo, Sri Lanka but luckily flights continued between Qatar and the Maldives and I could breathe once again… or at least I could until the Maldives declared a state of emergency a couple of weeks before our trip (it actually wasn’t bad at all). 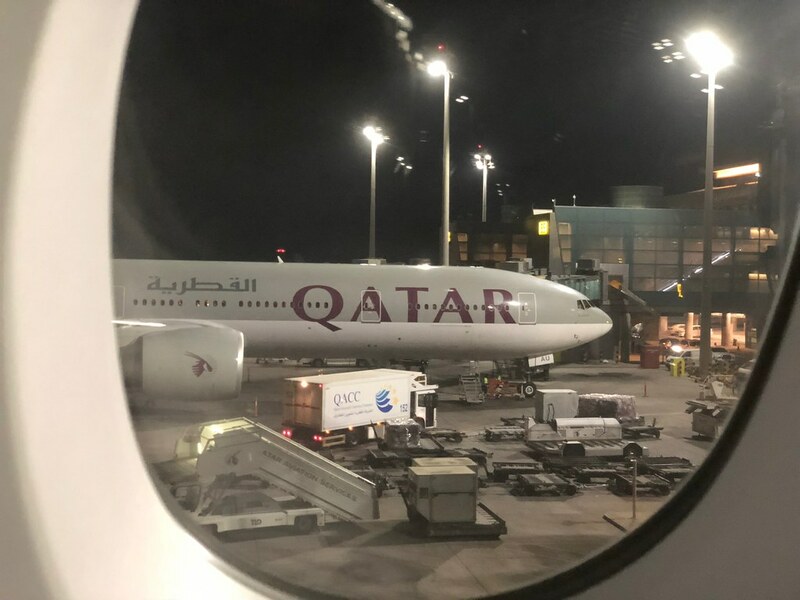 One last twist occurred before our trip as the aircraft between Doha and Male was swapped from an A330 to an A350. 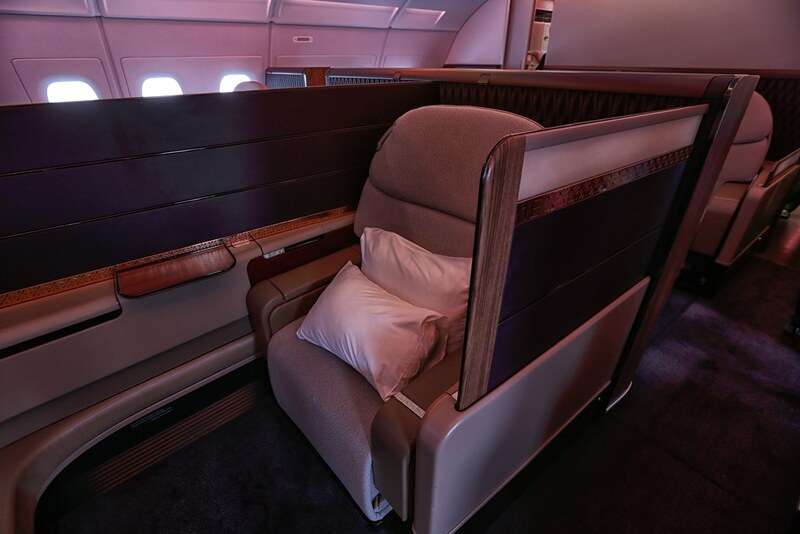 I much preferred the A350 1-2-1 layout in business class to the A330’s 2-2-2 so this was a welcomed change. 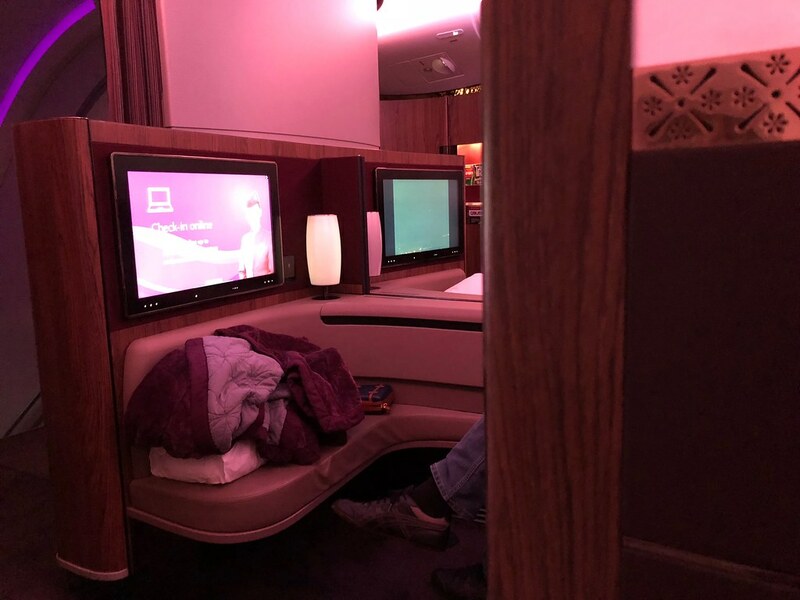 We’d just finished a stay at the Park Hyatt Paris-Vendôme and first made our way into the Qatar Airways Premium Lounge at CDG. That lounge was fantastic. 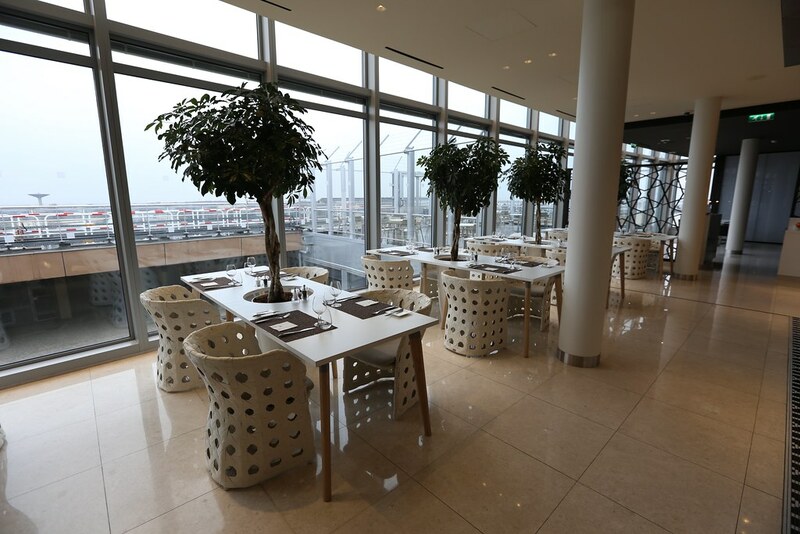 It’s stunning, spacious, and offers some solid dining options along with an outdoor terrace where you have Eiffel Tower views. 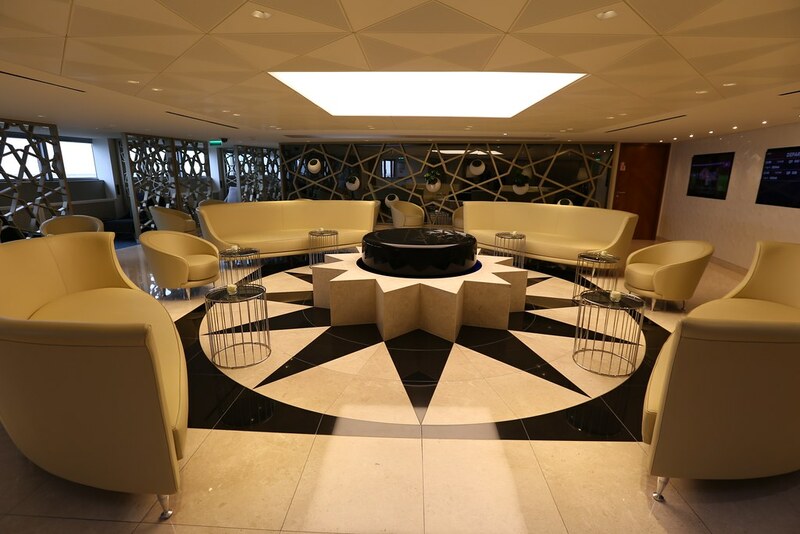 You can read my full review of the Qatar Airways Premium Lounge here. Qatar Airways Premium Lounge at CDG. 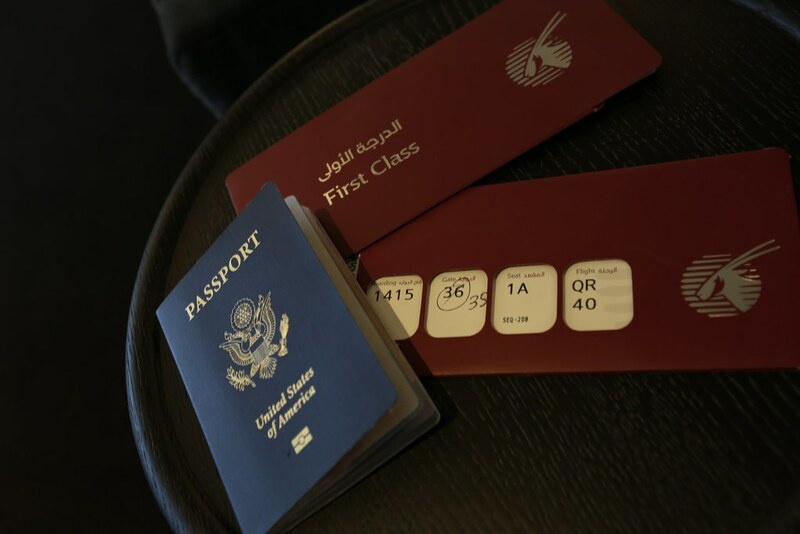 Qatar first class boarding passes. After making our way through security at the gate we approached the boarding area and would end up being the first passengers to board. Boarding area for our flight. Boarding started on time and we were directed to the first class cabin found in the front of the upper deck of the A380. Heading up the jet bridge. When we entered, the crew helped us to our seats and tended to our luggage. There’s a storage closet up front where they stored our carry-on luggage, as there are no overhead bins. 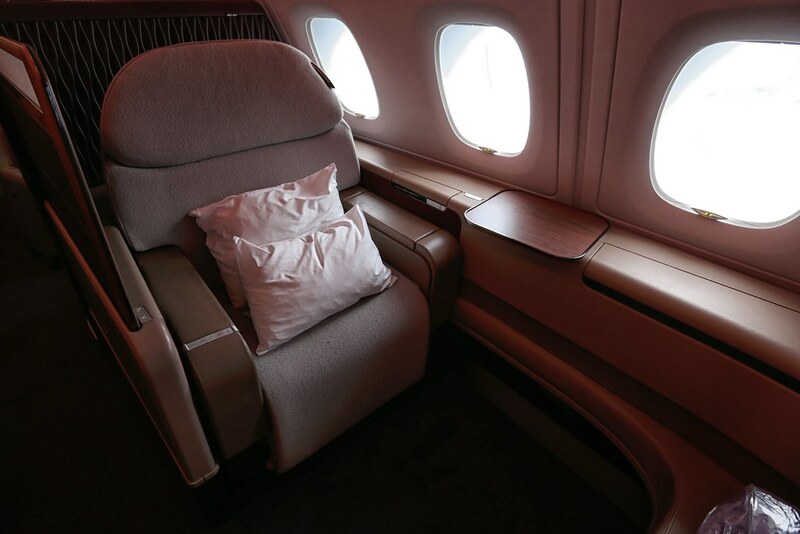 Upon seeing the first class cabin for the first time, I was surprised by how extremely elegant the cabin looked. 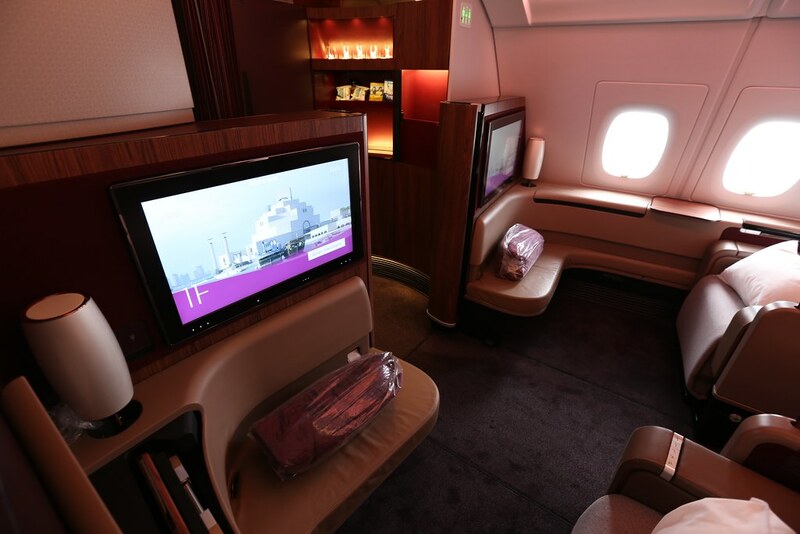 Qatar A380 first class cabin. I liked the contrasting tones used in the wood and seat cushions and accented mood lighting. 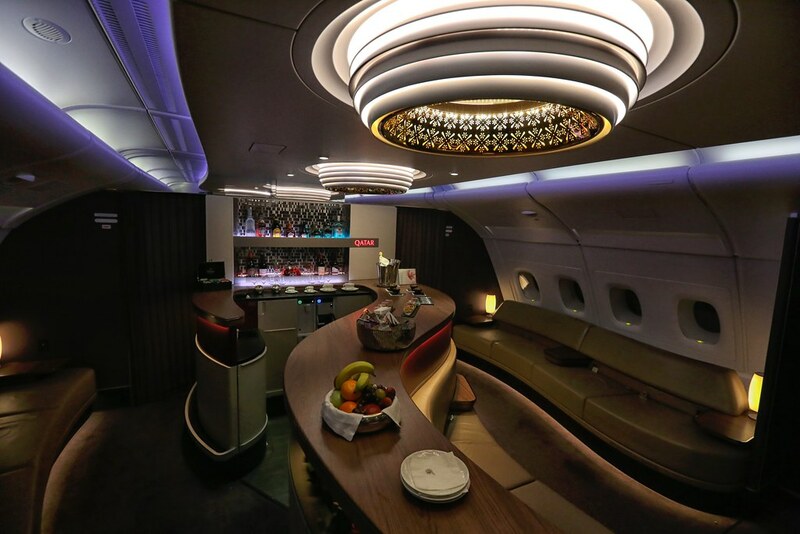 The layout reminded me of the Korean Air A380 first class cabin except much more elegant and private, with only eight total suites. The only thing that I wasn’t crazy about was that the seats were cloth. I prefer the look of leather found in other first class seats and think leather seats would’ve looked better. The cloth material is still quality though so this is hardly an issue. 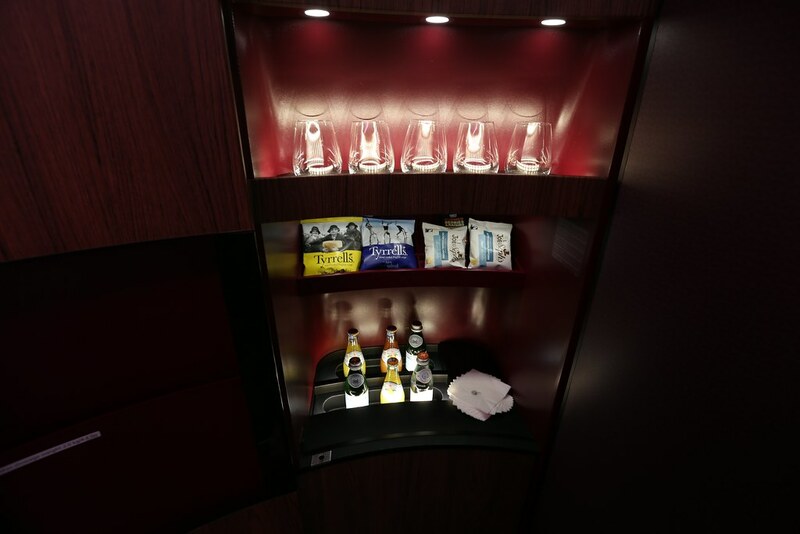 There’s a small area at the front of either side of the first class cabin where you can pick up snacks and drinks, such as water and juices. 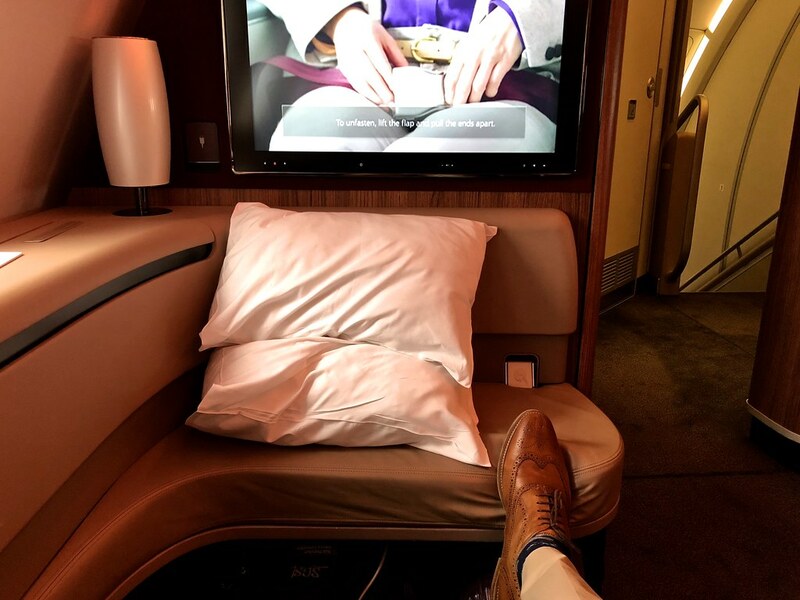 While there’s no bar in this section like Emirates, it’s still a gorgeous area that nicely welcomes you into the first class cabin. 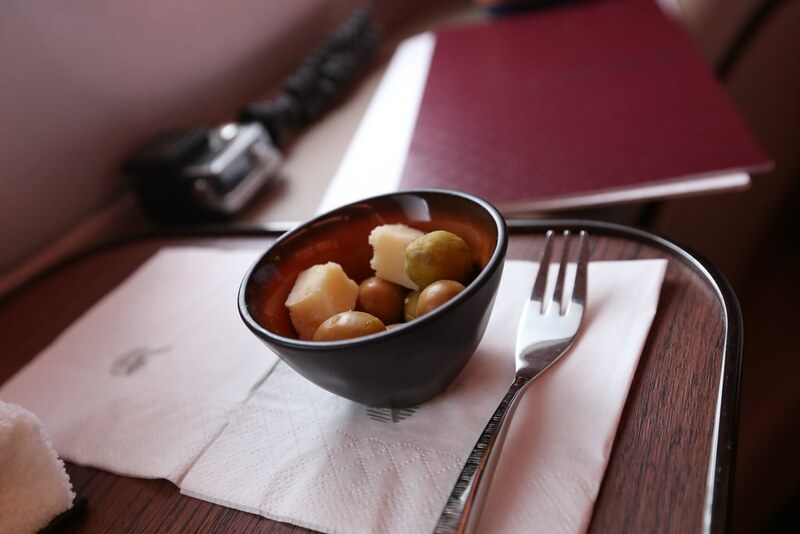 Qatar A380 first class cabin snacks. This is also where you’ll find the two lavatories which were very nice and spacious on the inside. 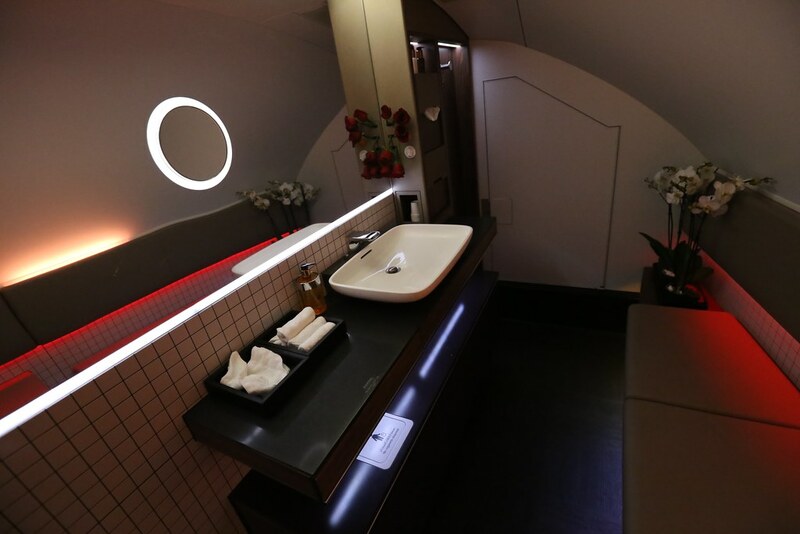 Qatar A380 first class lavatory. These suites are actually much more private (and bigger) than I originally thought. 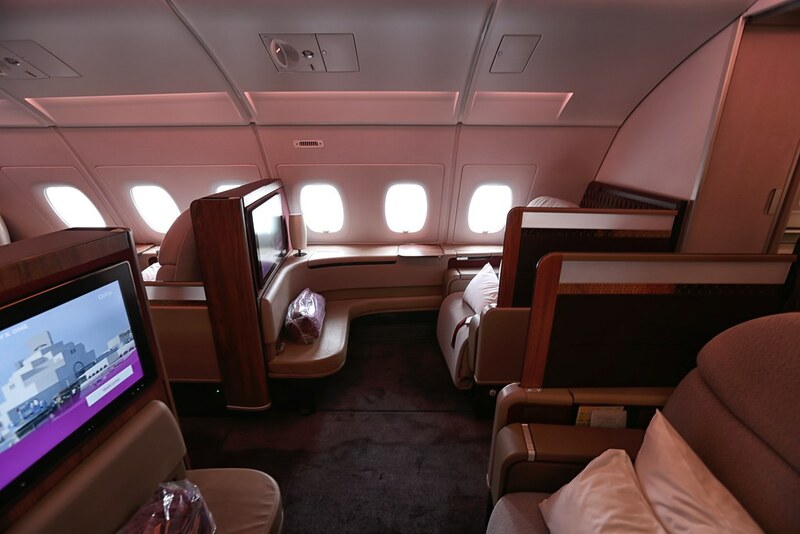 Qatar A380 first class suite with high partitions. 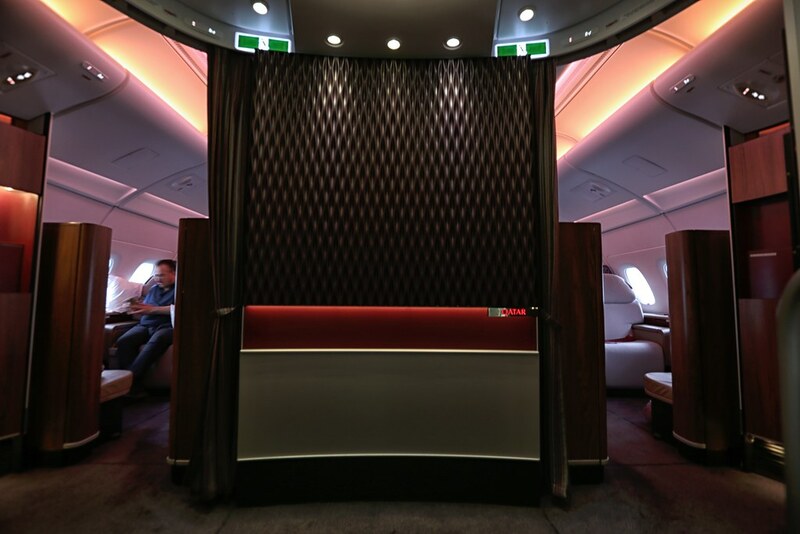 While it’s still very odd to me that Qatar has fully enclosed suites in their business class product and open suites in first, I honestly didn’t feel like these suites needed a door. Would a fully enclosed suite be nice? Sure, but the partitions are very tall and protrude far out so privacy never felt like an issue to me. Even the middle seats have high levels of privacy. 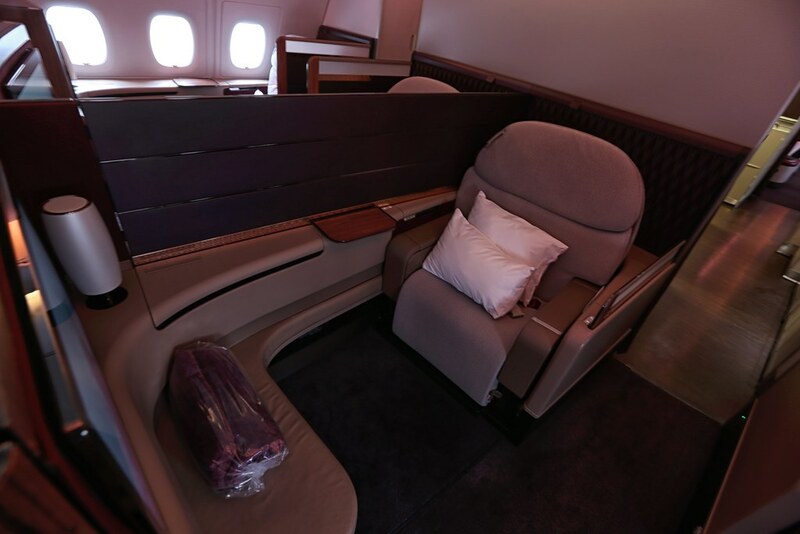 Qatar A380 first class cabin middle seats. However, I still think that the window seats offer much more privacy as is usually the case in any cabin. 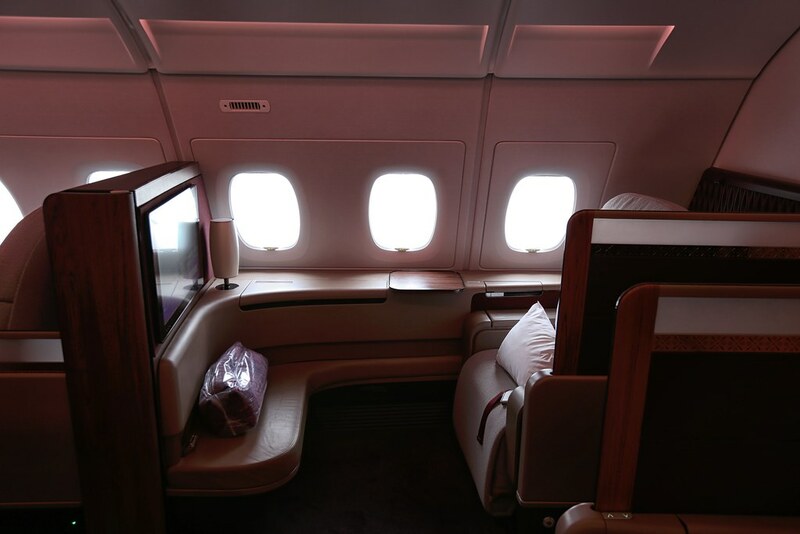 Qatar A380 first class cabin window seat. 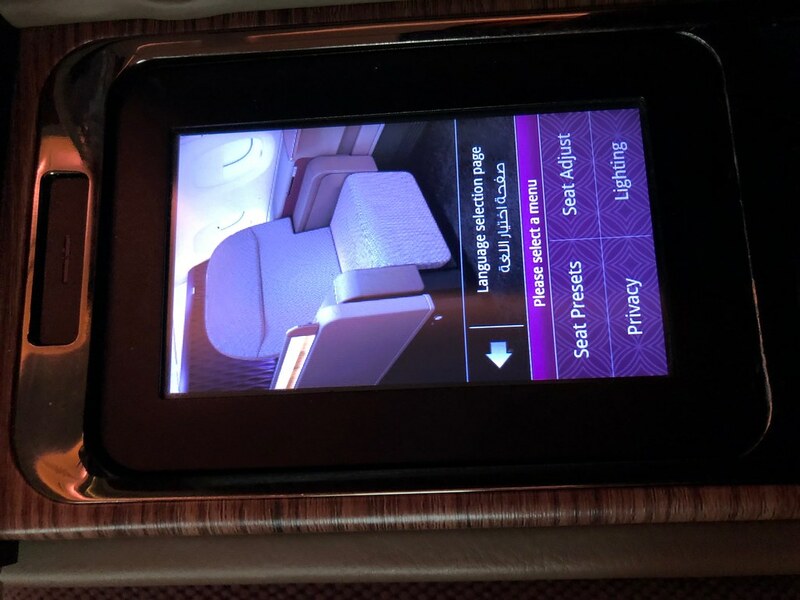 I went with seat 1A which I loved although I don’t think there’s really a bad seat in Qatar’s A380 first class cabin. The seats come with two pillows and there’s a blanket on the ottoman. They are very wide at 23 inches between armrests but feel even wider due to the extra-wide back cushion. 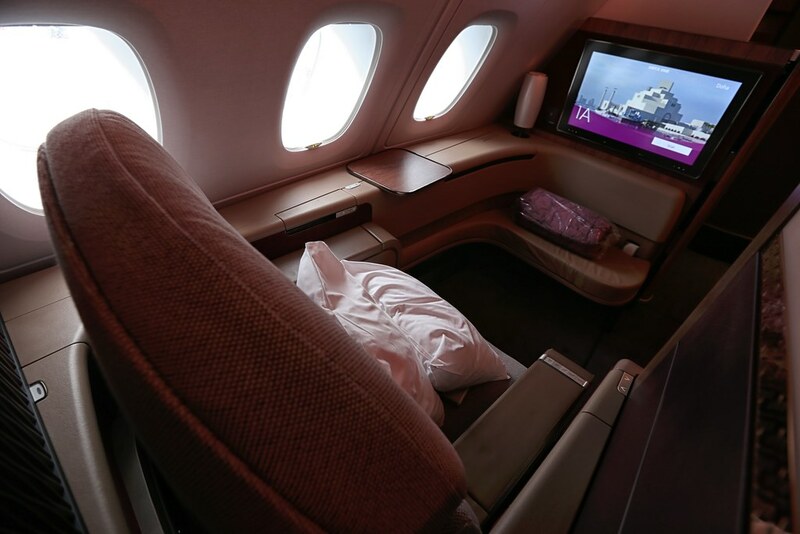 Qatar A380 first class seat, 1A. The suite itself felt very spacious and private. 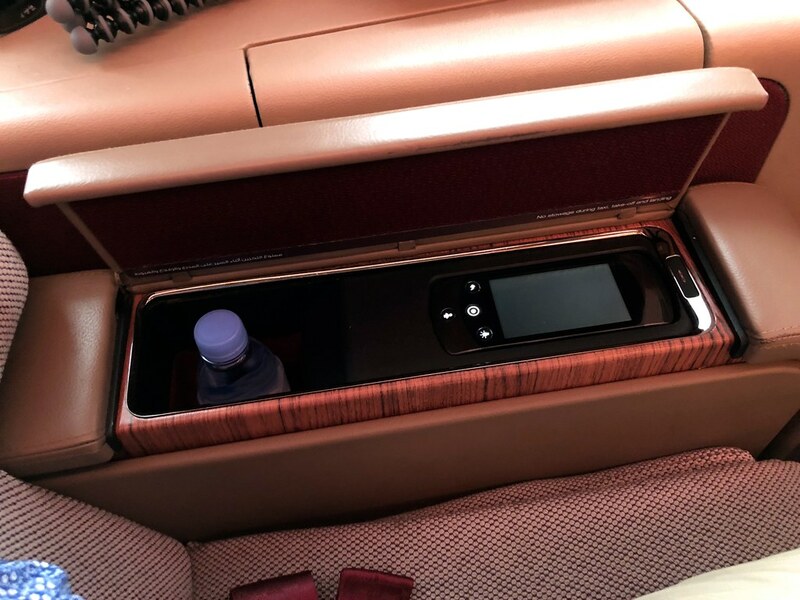 There’s a decent amount of functional counter space and a tray-like table built in to the seat’s counter, which was perfect for setting down drinks, snacks, or even electronics. 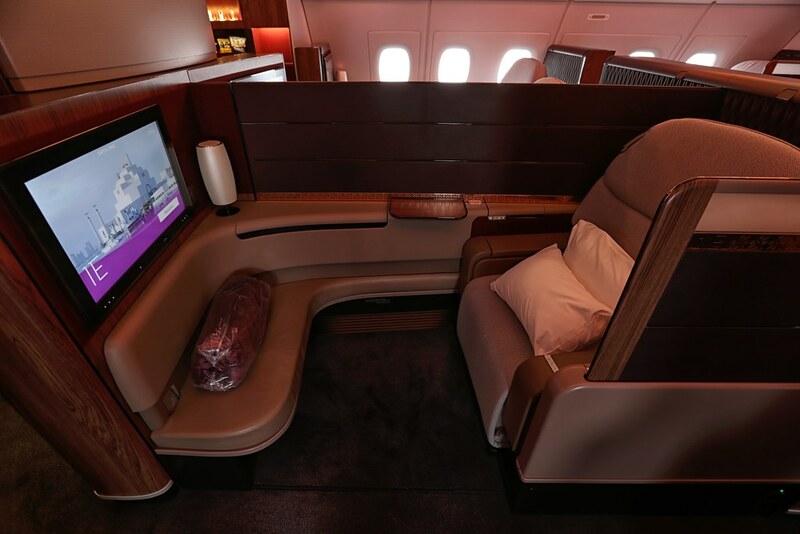 Qatar A380 first class suite. You can get a sense of how private the seats are below. I guess the one drawback is that there’s no partition extending from the front of the suite so it’s easy for people to see what you’re watching and your feet feel a bit exposed. My view from seat 1A. 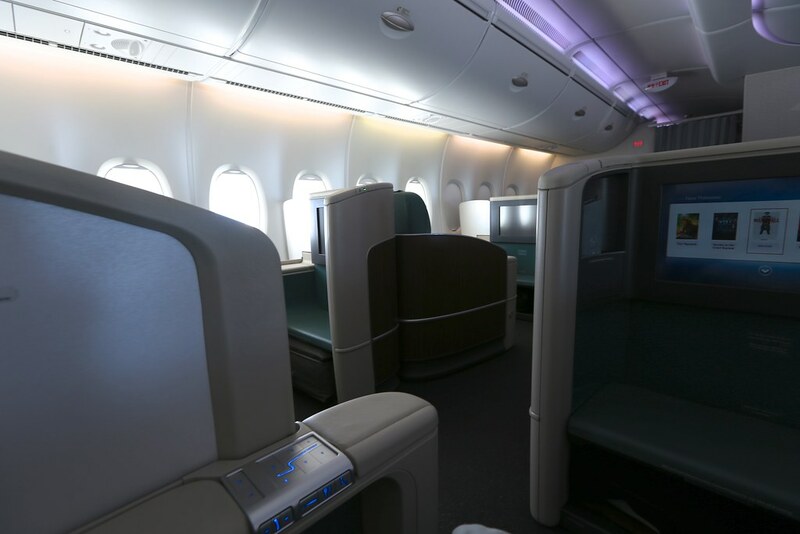 Other first class cabins like Korean Air’s A380 (pictured below) provide more privacy for your in-flight entertainment viewing (at least from those sitting next to you) and offer more privacy to keep your feet from being exposed. Personally, I’m not ashamed that sometimes I resort to watching Pixar movies on planes and don’t mind showing off my fresh socks so I don’t really care but it’s something I thought was worth pointing out. Each suite features an ottoman with space below to store a small to medium sized bag like a back pack. From the take-off position, I could just barely touch the ottoman to rest my feet (I’m 6′ 1″). This distance works out if you’re trying to share a meal at your seat though since it gives your partner plenty of room to sit. There’s a wardrobe built into the suite wall behind the ottoman/TV which is actually pretty spacious. 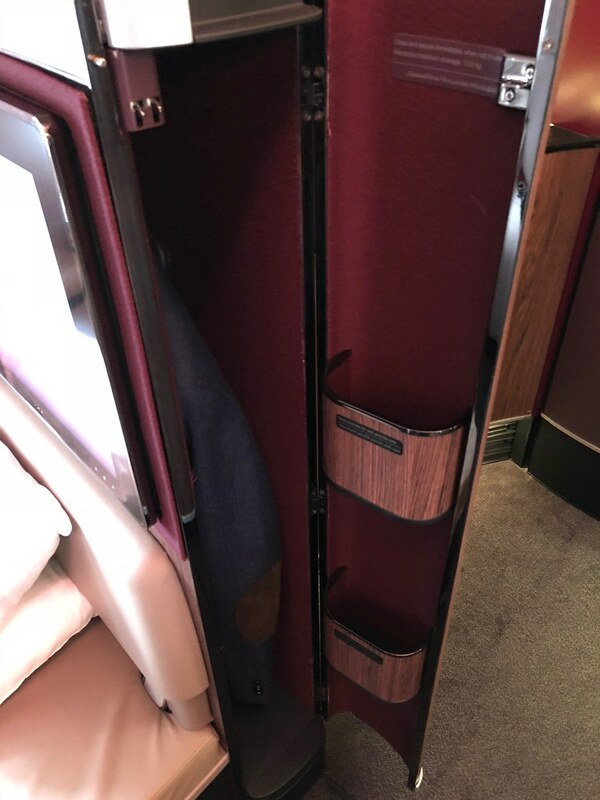 Qatar A380 first class wardrobe. The TV is pretty big at 26 inches and it’s also a touch screen. Directly to the left of the TV is a power outlet and lamp. 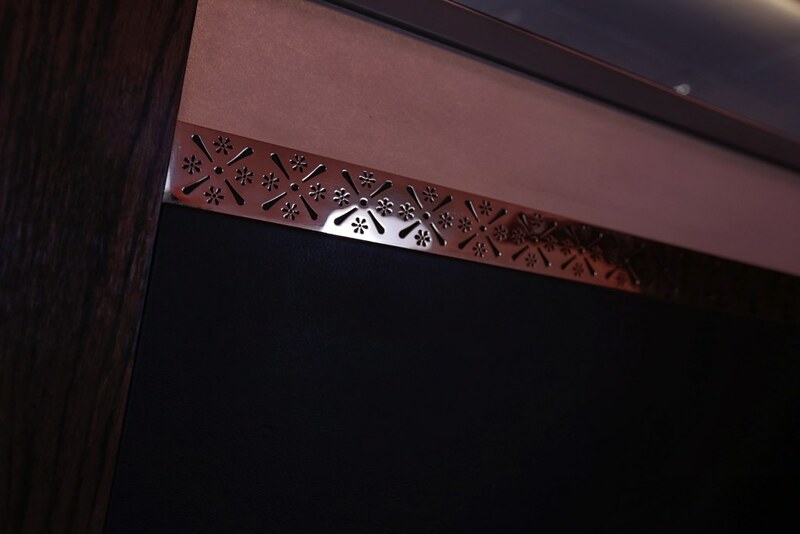 I personally liked how they integrated the monitor into the wood grain panel with the touch of the lamp for additional elegance. 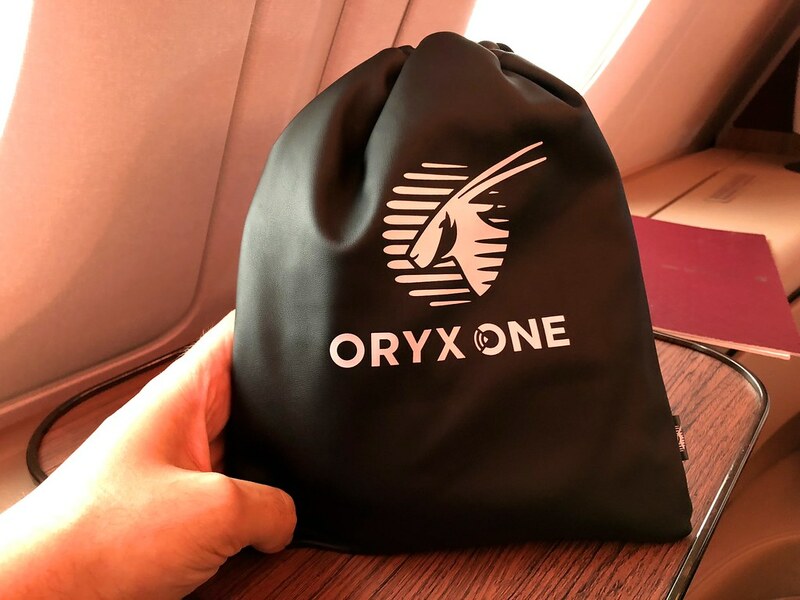 The Oryx One in-flight entertainment had a good selection of TV shows and movies (you can check on current listings for your flight here). I had issues with my in-flight entertainment since I could not pause movies — only stop them. This made it very tedious to take a break during movies so that was one of the negatives during the flight. 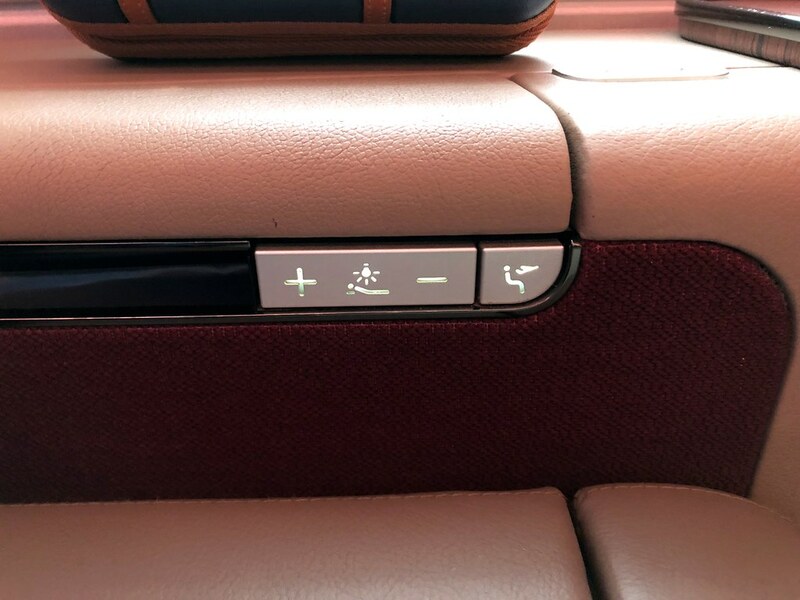 The seat and lighting controls are pretty standard and very intuitive. You’ll find some on the left, where you’ll also find a compartment holding the in-flight controller and a bottle of water. IFE controller and bottled water. On the right side are the standard seat controls and within the compartment on that side you’ll find the privacy controls and the headphones, which I thought were high quality although not quite Bose quality. 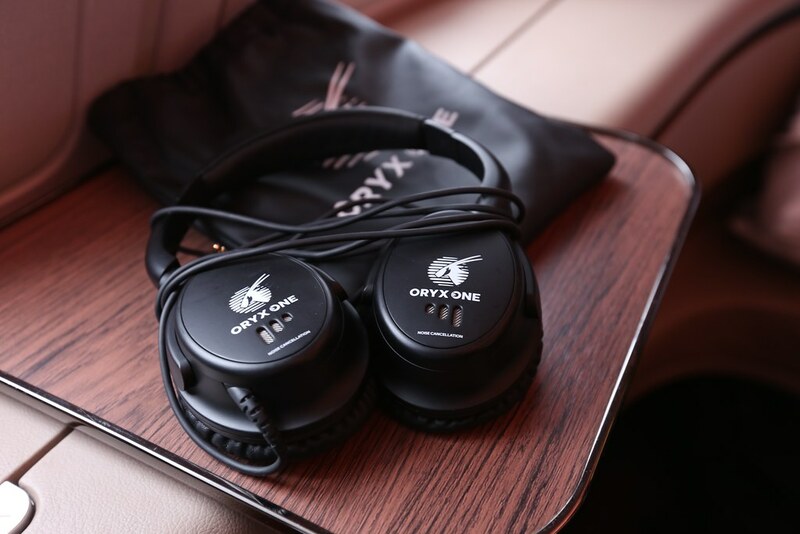 Qatar A380 first class headphones. Touch screen privacy and lighting controls. 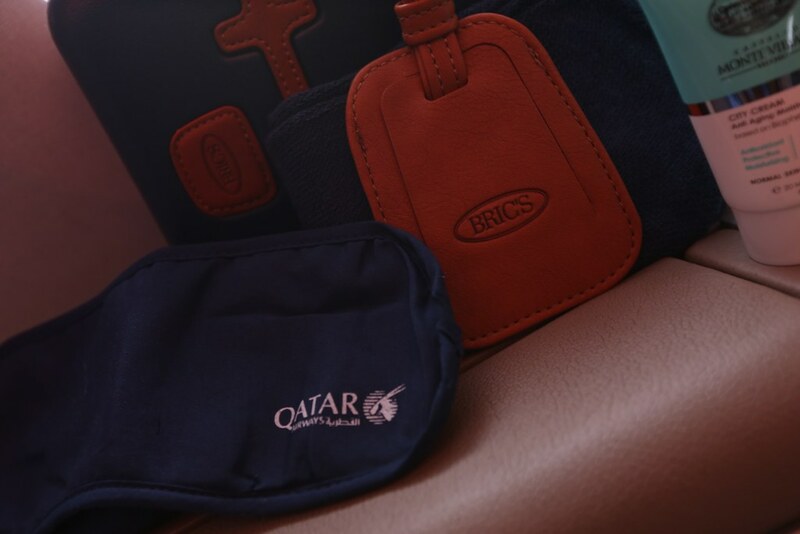 The amenity kit is issued by Brics, which is an Italian company known for high quality luggage. 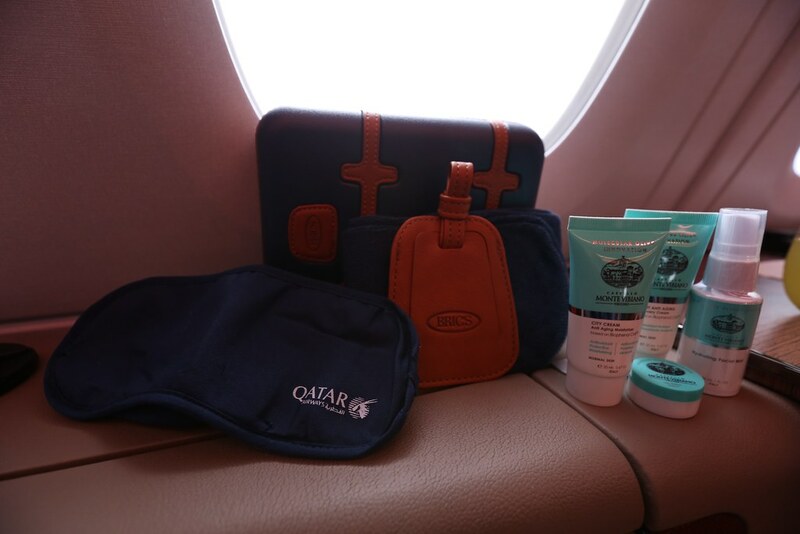 Qatar A380 first class amenity kit. The kit contains an eye shield, socks, lip balm, anti-aging moisturizers, and hydrating facial mist. 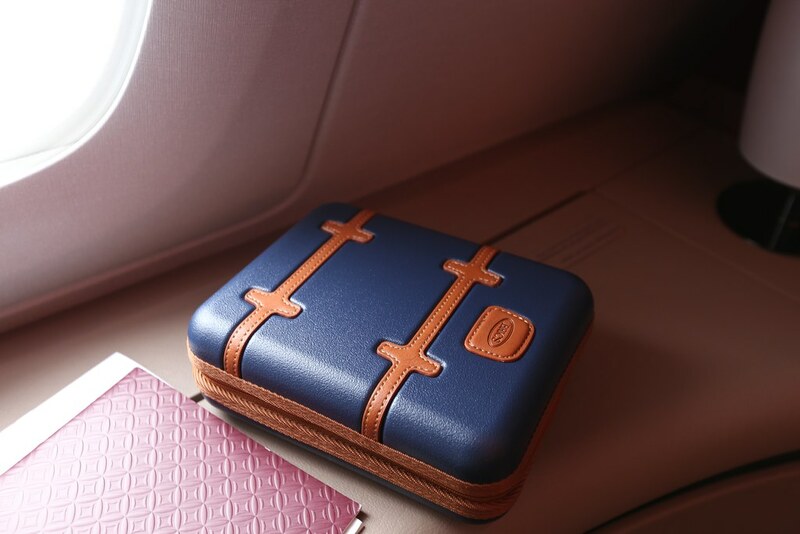 It also comes with a Bric’s leather luggage tag that I loved but would feel odd using it on non-Bric’s luggage. 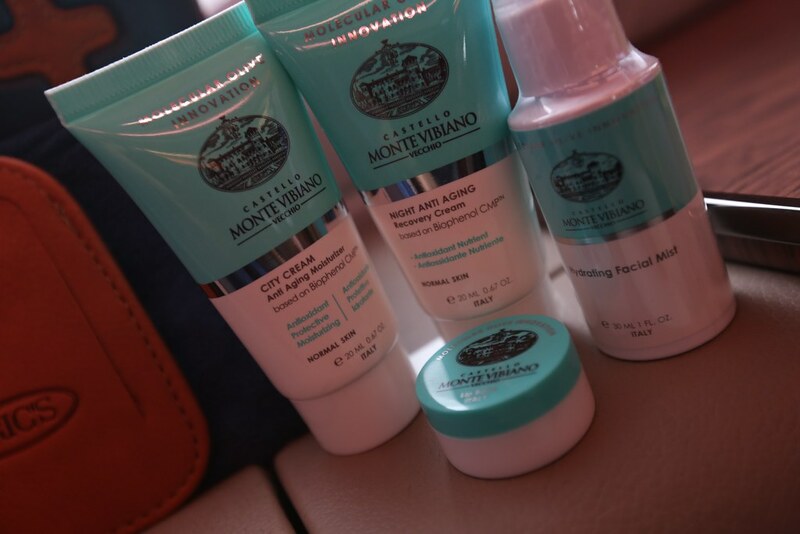 The moisturizers are from Castello Monte Vibiano. The bar serving up the champagne hadn’t opened yet so I requested for the lemon mint drink, which is a signature drink of Qatar Airways. It was very refreshing and it’s such a great starter drink (with no alcohol). They also offered some olives and other snacks, such as an individually wrapped date. 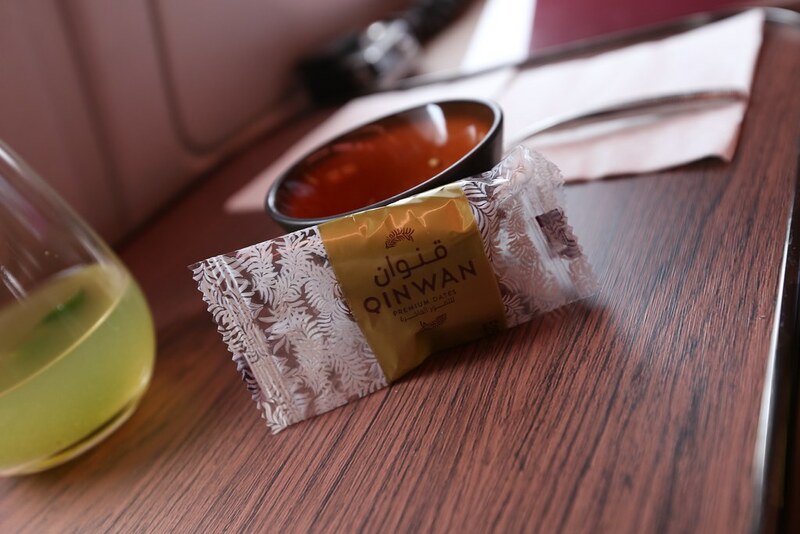 Pre-departure Qatar first class snacks. With olives and a the fresh minty drink, I was all settled and ready for take off. 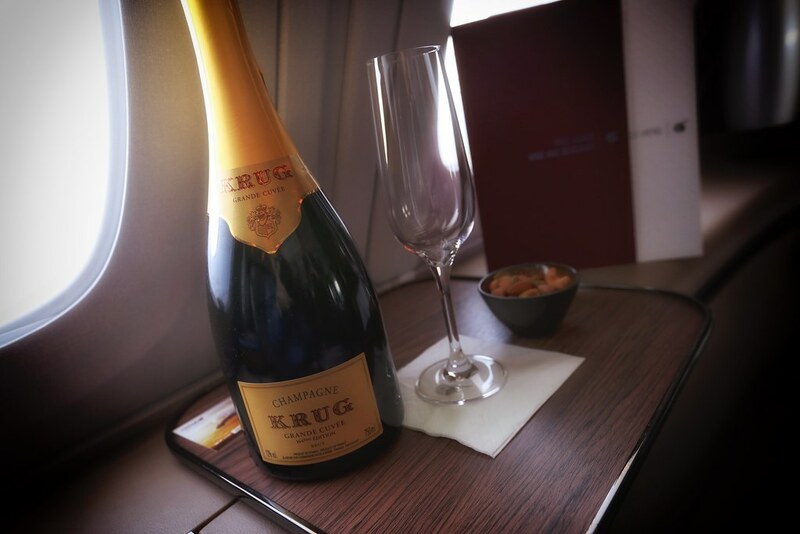 Once we got up in the air they started pouring the Krug, which I consider to be on par with Dom. 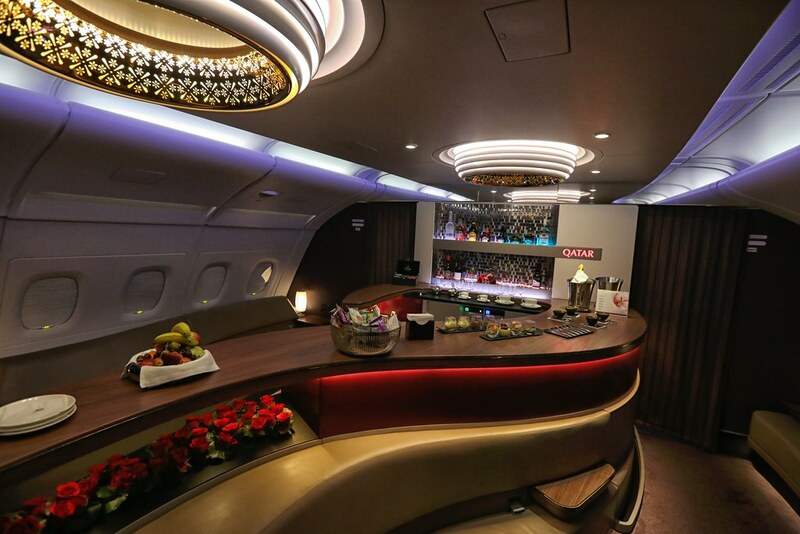 Qatar A380 First Class champagne. 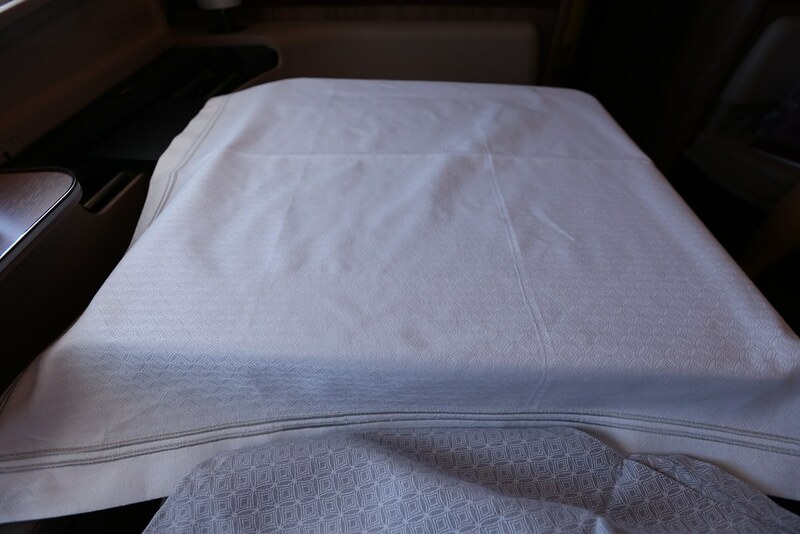 When it came time to eat, they pulled out a massive tray table and covered with with a heavy tablecloth. The tray table slides pretty far away from you so you should be able to slip out of your seat if needed. 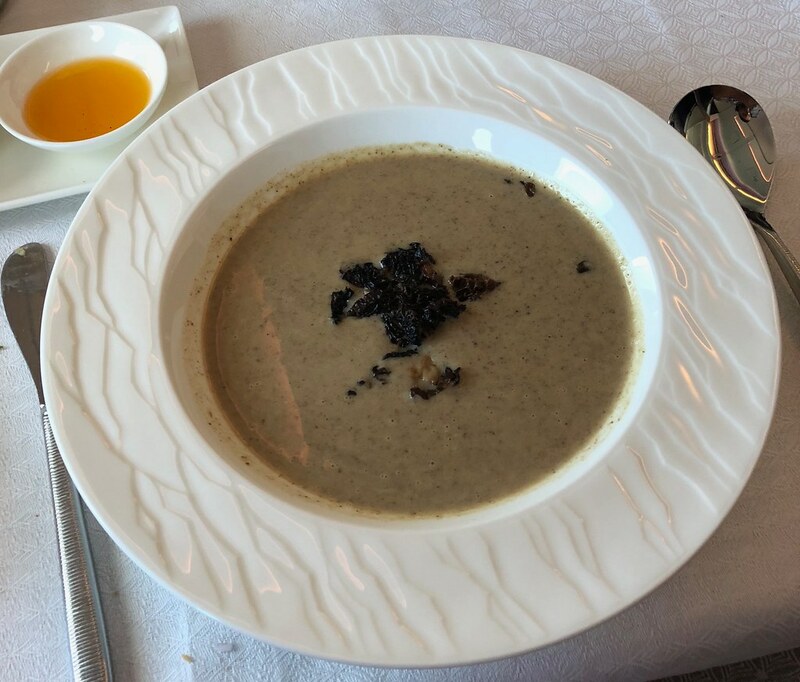 The first item they brought out was the soup, which was a mushroom soup with sautéed morels. I actually declined the soup but Brad gave it a shot. He liked the flavor but thought that the mushrooms had an unusually dry texture. Mushroom soup with sautéed morels. Then came the caviar with additional condiments. I’ve seen better presentations before but for me it’s all about the flavor, which was fantastic. 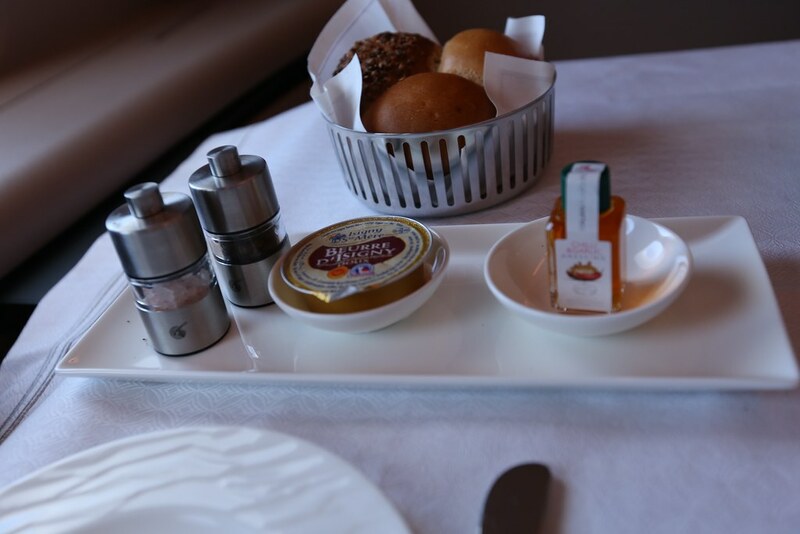 I still can’t believe Etihad doesn’t offer caviar while so many other top first class products do. 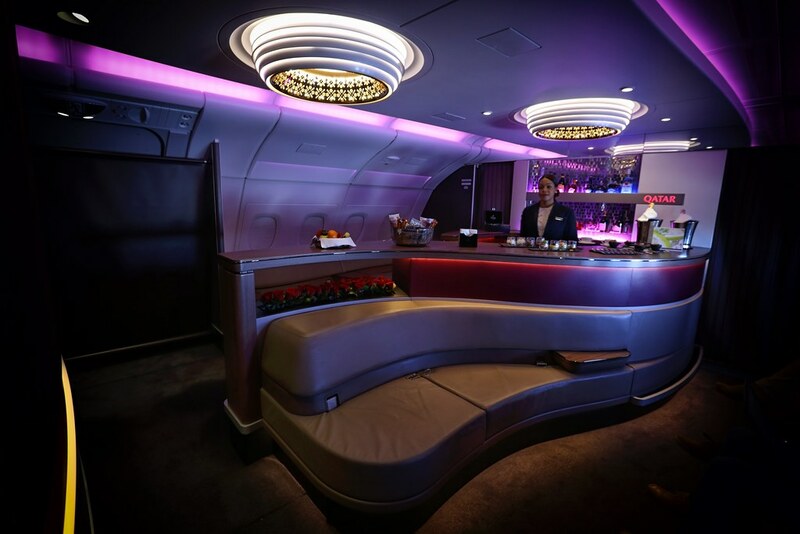 Qatar A380 first class caviar. 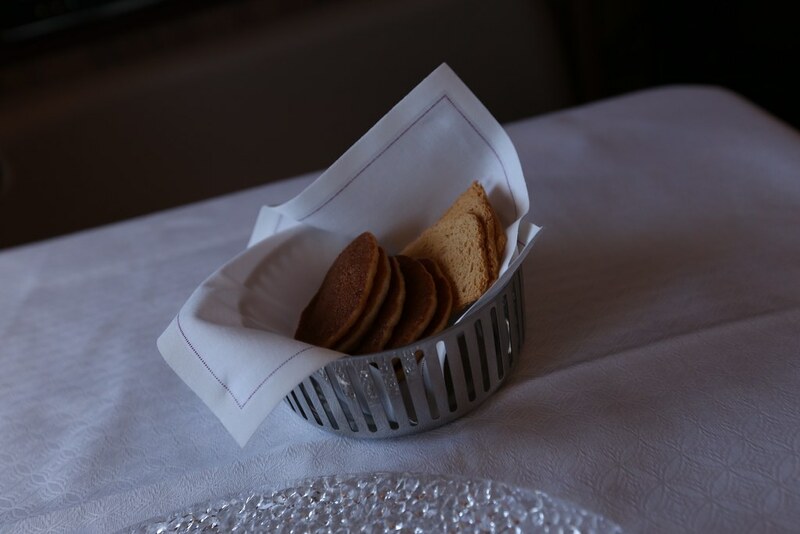 Along with the caviar we were given both crispy and soft crackers. I prefer crispy crackers with caviar so it’s nice that Qatar gave us different choices. Then came the breads along with specially selected oil/dressing. Qatar A380 first class breads. 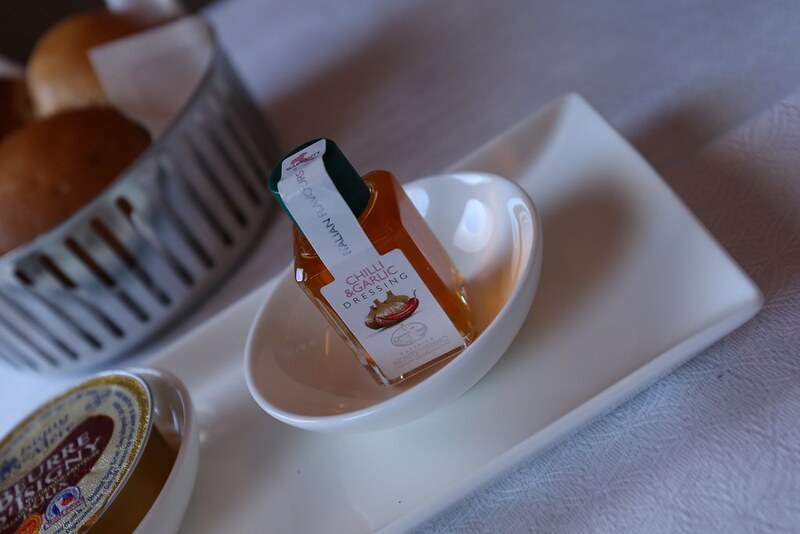 Qatar A380 first class breads and oil. 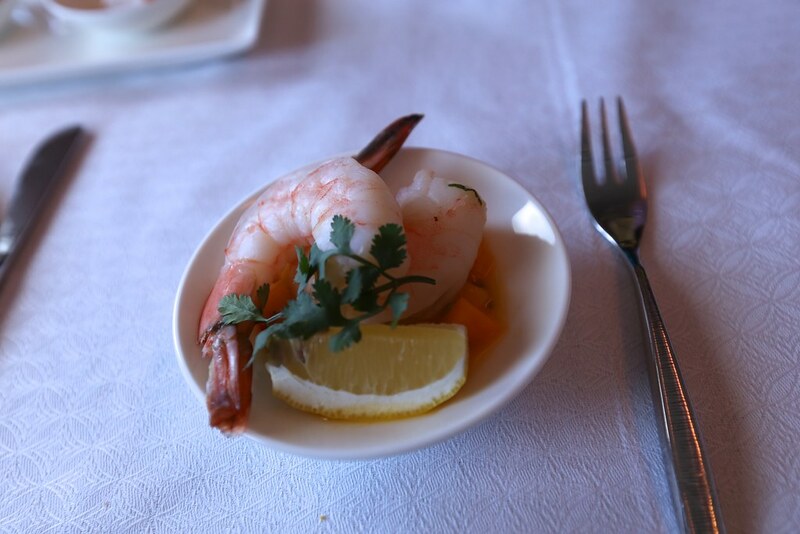 The next dish was a small shrimp dish which I wasn’t very crazy about. Qatar A380 first class dining. 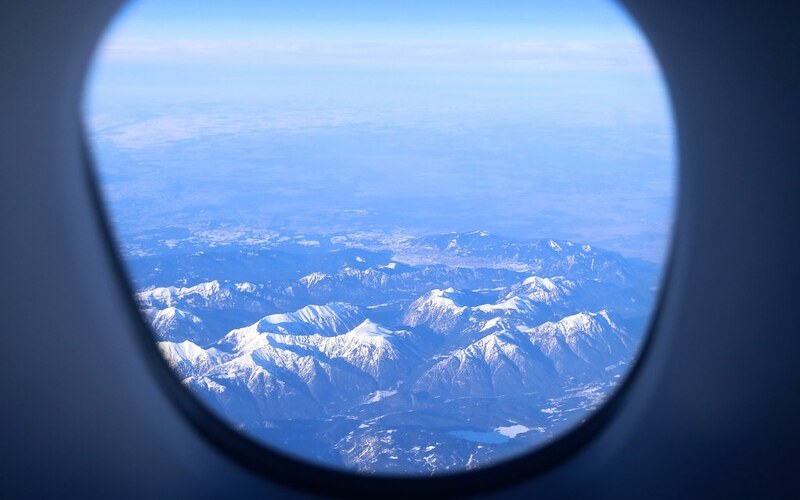 Right about this time we were flying over the Alps, and I was very thankful that we’d decided to take window seats. This was my first time flying over the Alps in the day time and the views were unbelievable. 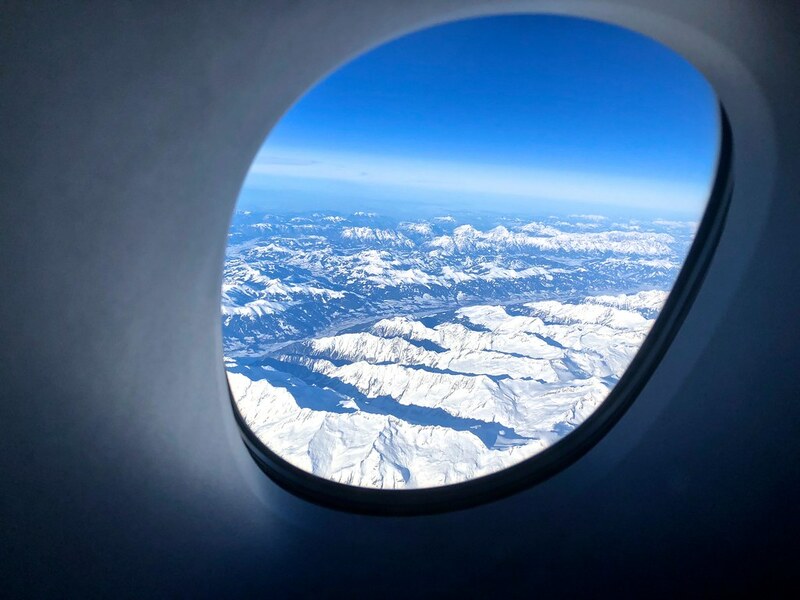 The windows on the A380 upper deck are quite small and it’s hard to get photos but you can still appreciate the views. I think flying over snowy mountain ranges will always blow me away no matter how many times I do it. Beautiful views of the Alps. 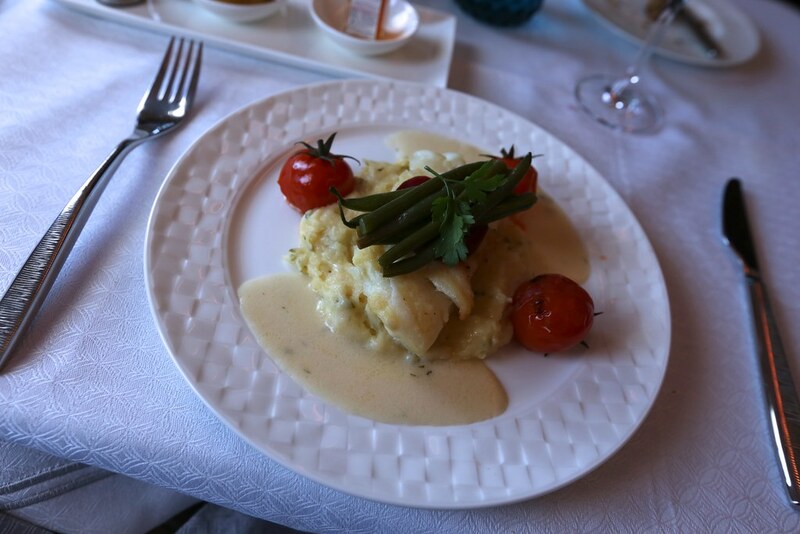 Then came the main dish which was the grilled cod on potato puree. Both the cod and puree had wonderful texture and flavor which was brought out fully with the sauce. I love getting an unexpectedly hearty meal on a plane so I felt like I made a great choice. Grilled cod on potato puree. 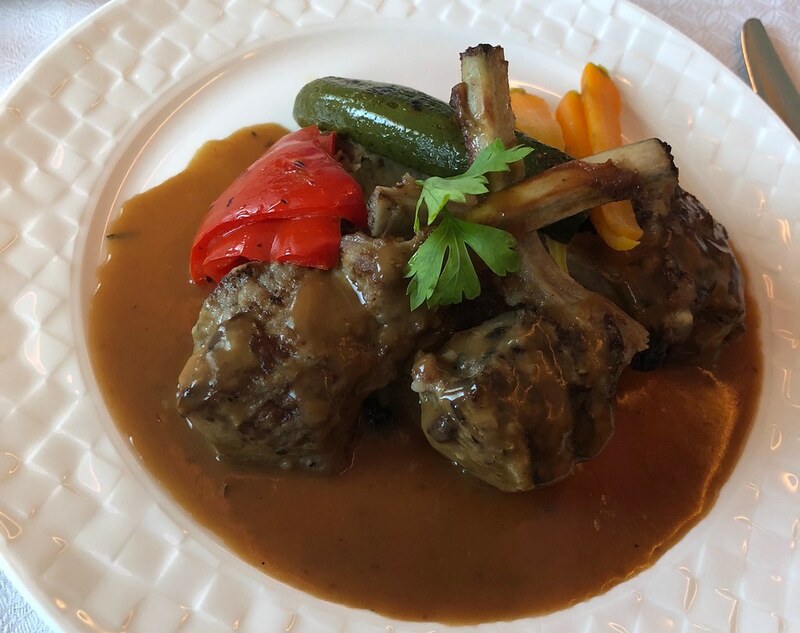 Brad went with the French trimmed lamb cutlets. Here’s a pic of the menu main items but you can check out my entire photo album for the full dining and wine menus. 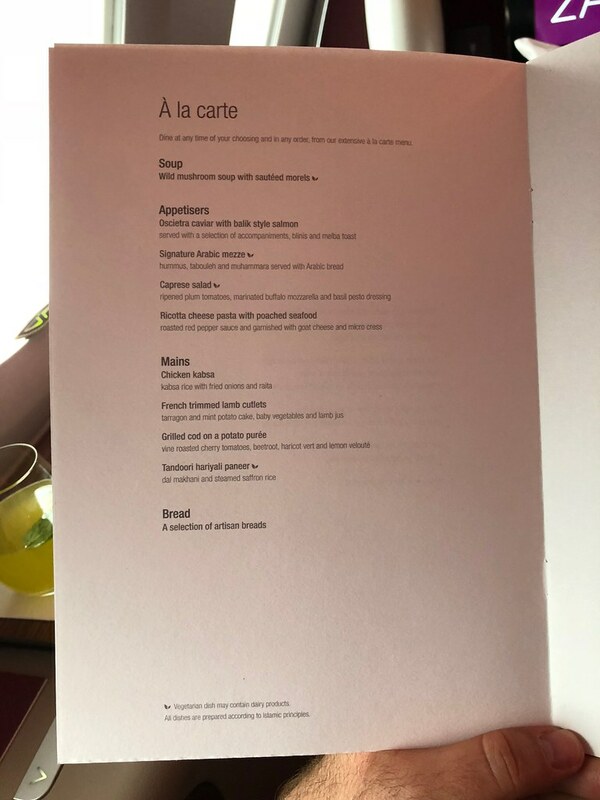 Qatar Airways first class menu. Overall, the service was very solid on this flight. From the moment we stepped in, we were given a lot of attention and everyone in the crew was very warm and personable. I also loved how — like other Middle Eastern carriers — the crew was very diverse. I’d read mixed reviews about Qatar’s service but this flight left me with overwhelmingly positive feelings about them. 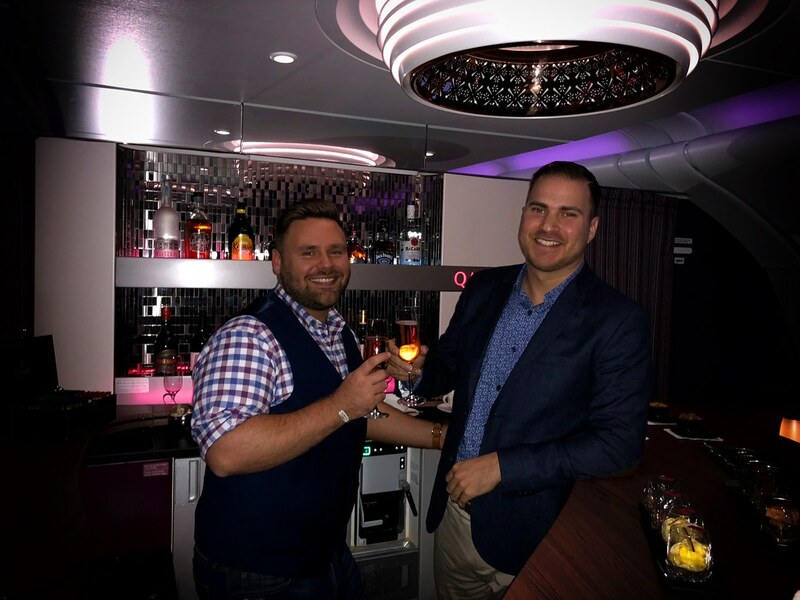 After dinner, it was time to check out the famed Qatar Airways A380 bar, officially known as “The Lounge.” Out of all of the different carriers with on-board bars and lounges, I think Qatar is clearly the winner for best overall bar. First, the bar area is absolutely stunning. 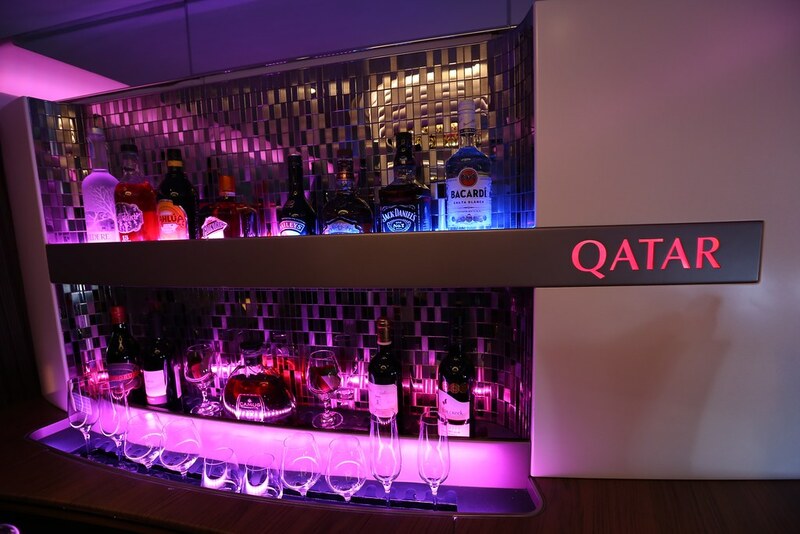 Qatar A380 first class bar. It’s also a spacious area with sofas incorporated seamlessly into the design so that several people can find room to sit and easily socialize. 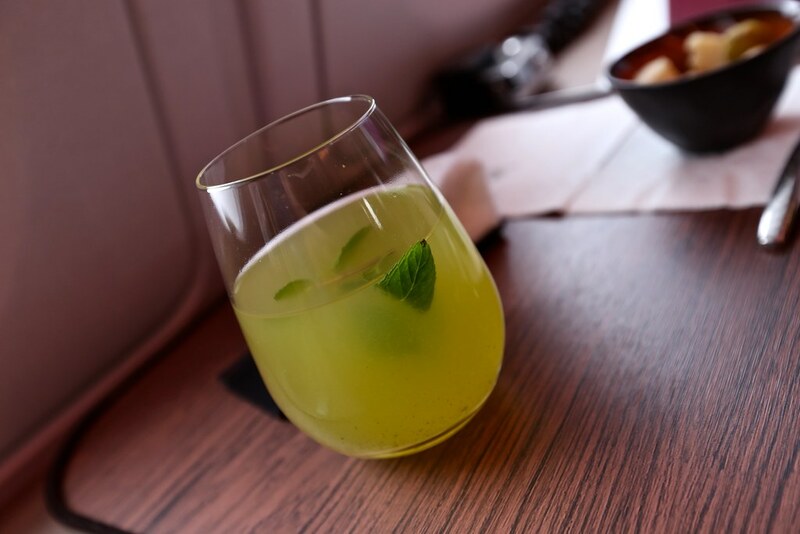 The spirits at the bar aren’t quite as premium as those found on board Emirates but there is still a good selection. They also serve different types of snacks at the bar as well. 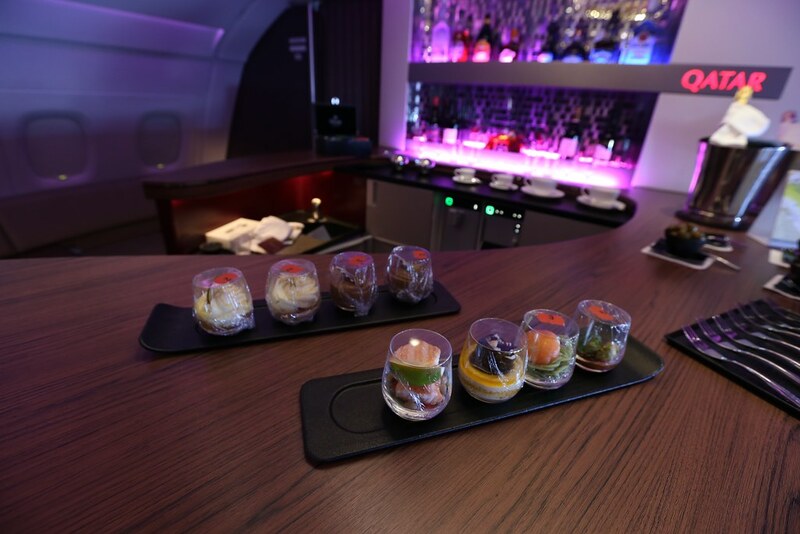 Qatar A380 first class bar snacks. With the mood lighting set, I thought the bar looked like a work of art. 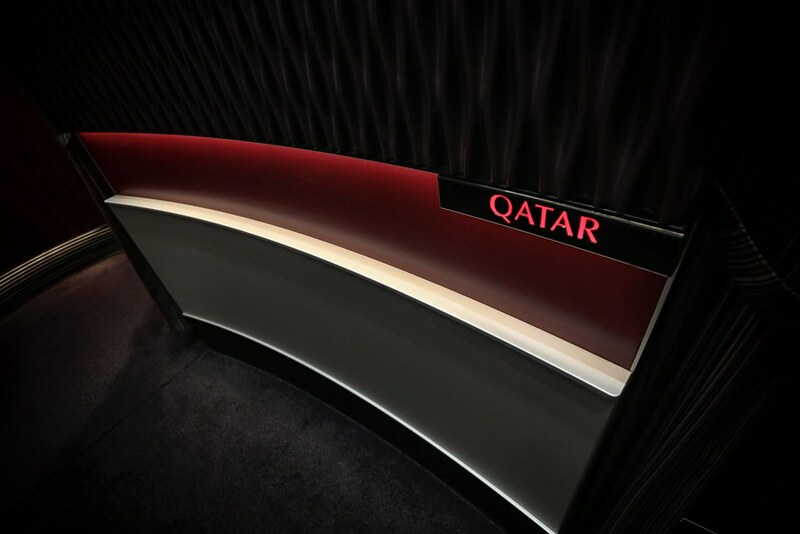 Beautiful lighting at the Qatar A380 bar and lounge. The bar area can get quite crowded though. I really struggled to get photos without any people because everyone wanted to hang out at the lounge (understandably so). Luckily, the crew let me get a few minutes in towards the end of the light which I was very grateful for. Having a good time at the bar. I rarely sleep on planes and when we’re talking about a 6 hour 20 min flight, it’s hard for me to justify sleeping because I’d rather experience the product and get footage. But this was especially true here where I knew that I’d be able to get some rest later on at the first class lounge in Doha. Nevertheless, I decided to try out the seat in its lie-flat position. 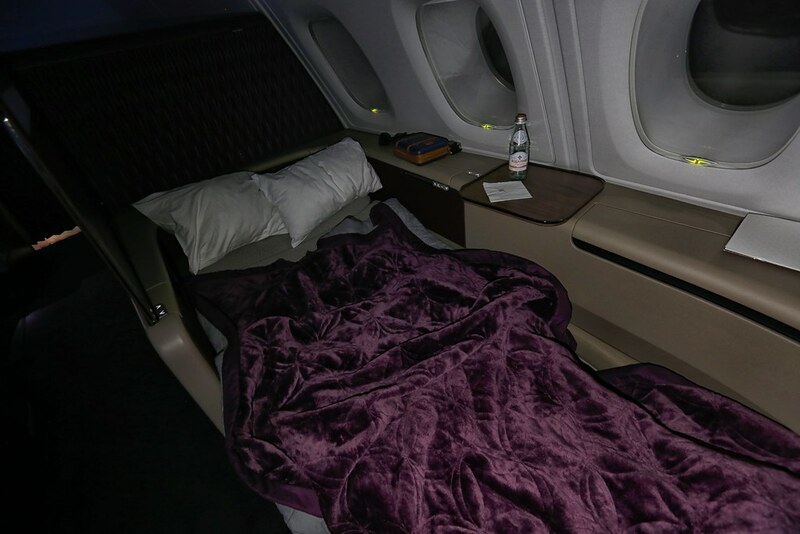 Qatar A380 first class bed. With the seat in the lie-flat position, the bed width is a whopping 33 inches and the length is 81 inches. I would imagine that with any sort of bedding, you’d be able to easily find a comfortable position given how much space you have to contort your body in just about any position. 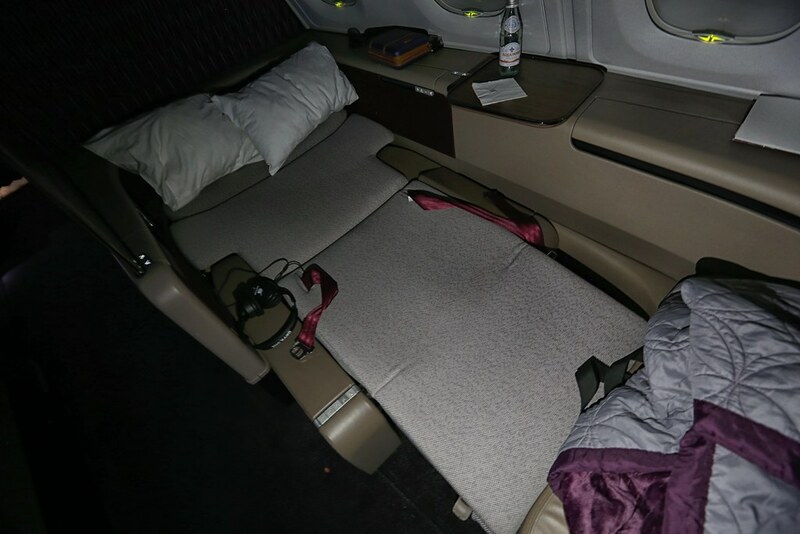 One thing I noticed was that the staff didn’t ask me if I wanted turn down service even when I had clearly put my seat in the sleep position and pulled out the blanket. 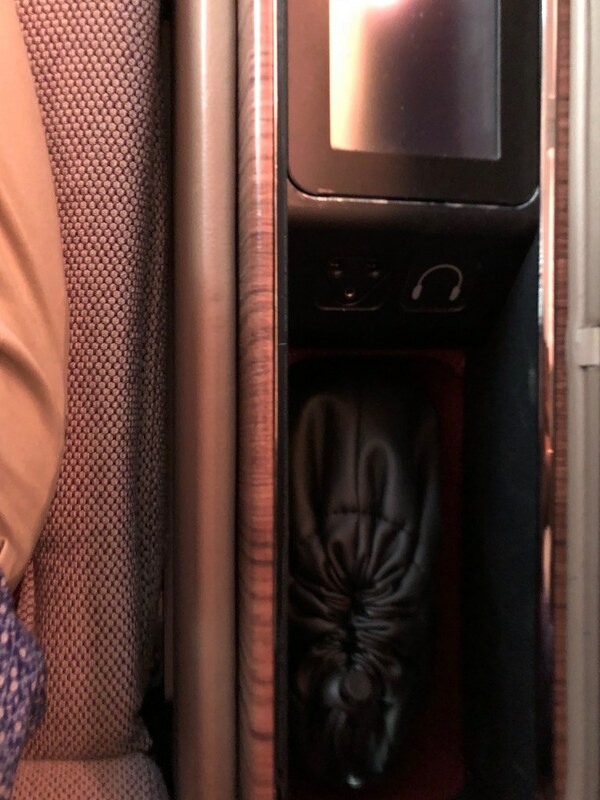 I actually didn’t want turn down service since this was a medium-haul flight, but I thought it was odd they didn’t ask when Etihad had offered it on an even shorter flight from MLE to AUH. 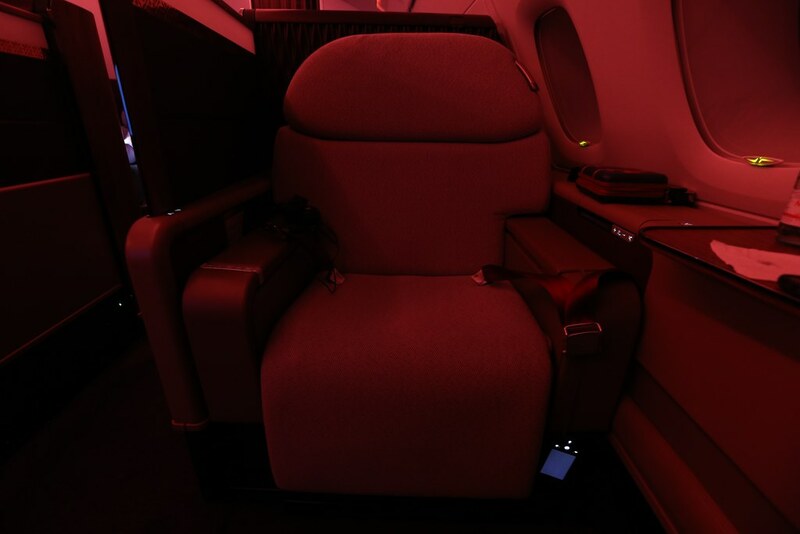 After trying out the bed, we got closer to landing and some relaxing red mood lights kicked on. 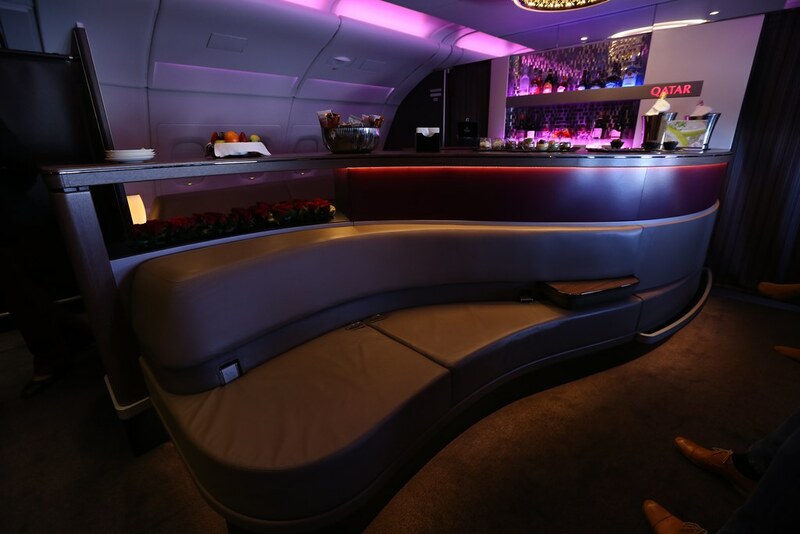 Qatar A380 first class mood lighting. And then we finally arrived and were off to experience the first class Al Sawfa Lounge for close to nine hours! 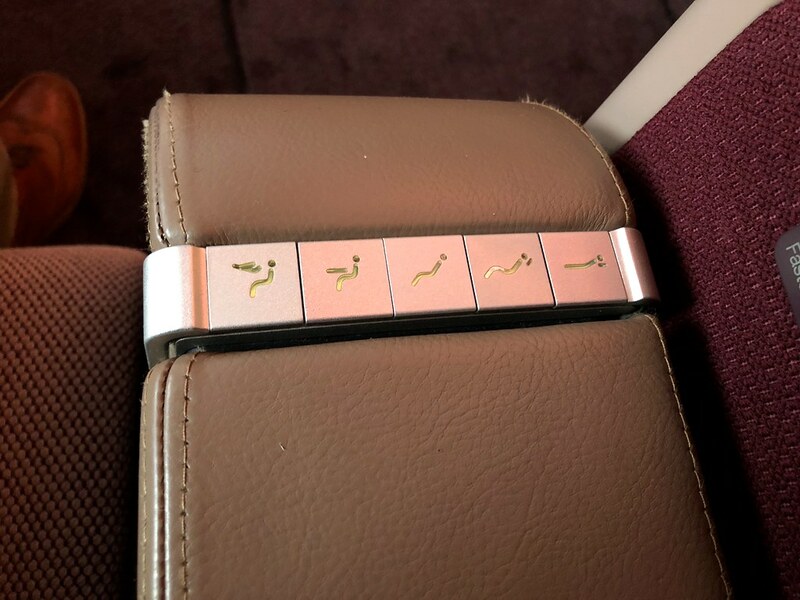 The Qatar first class experience was better than I had expected. The suites were more luxurious and private than I had imagined and the service was on point (for the most part). 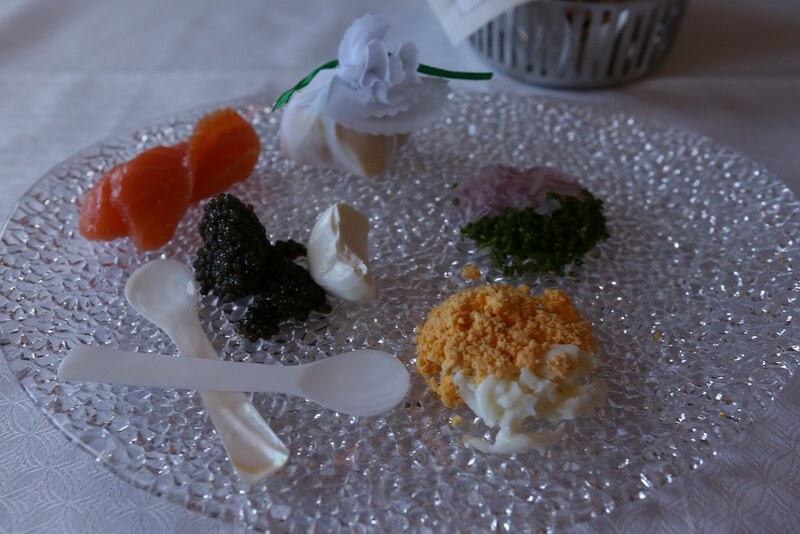 I also had a great dining experience and it’s always great to be served caviar along with free-flowing Krug. And while I didn’t make a proper bed, there’s a ton of sleeping such that I think it’d be very easy to get into a comfortable position. 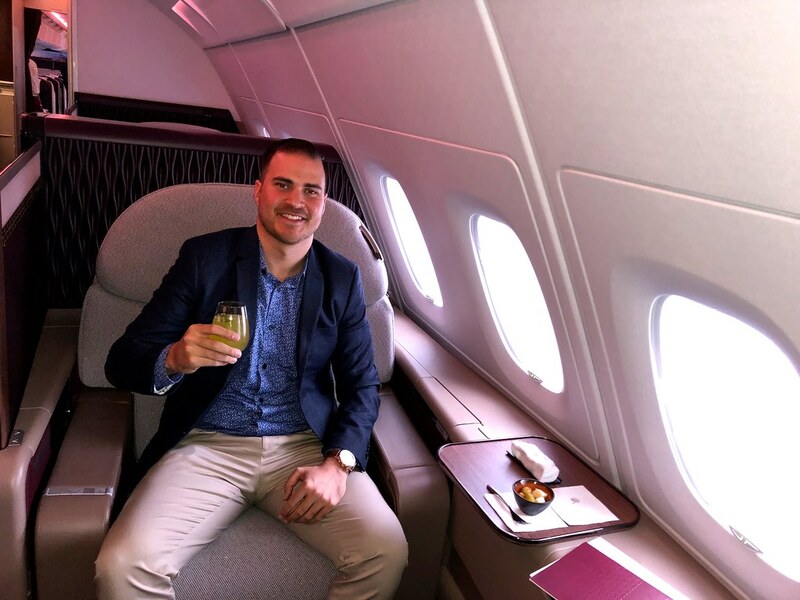 I think Qatar easily rates among the best first class flights I’ve had to date and I would happily fly with them again.